IBM documents show chief executive Ginni Rometty actually has realized nearly $6 million in incentives and stock sales since last August. 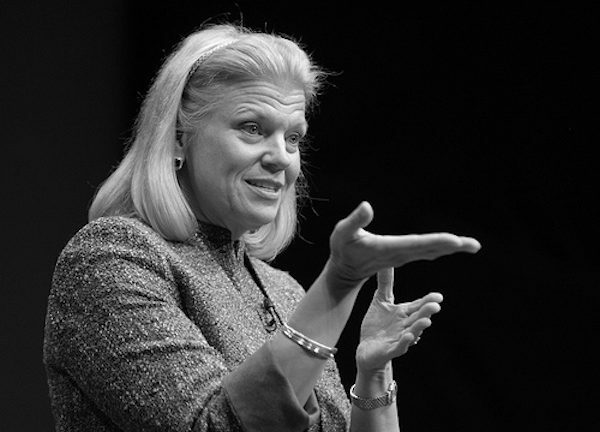 Could IBM’s (IBM) awarding chief executive Ginni Rometty a $3.6 million bonus for her performance in 2014—a year in which the vendor suffered its 11th straight quarter of declining revenue—possibly been more ill-timed, arriving amid a seemingly widescale layoff? In fact, IBM documents show Rometty actually has realized nearly $6 million in incentives and stock sales since last August. First, IBM 8-K SEC filings on Aug. 28 show Rometty (or her proxies) executed 32 sales of IBM stock on Aug. 27, selling some 26,113 shares at an average value of $191.74 for a $5 million gain. On the same day, Rometty purchased 27,678 shares of IBM stock at an average cost of $96.73, making her net take on the day about $2.3 million. Of course, under SEC rule 10b5-1, the timing of Rometty’s trades had to have been pre-arranged, but still, if you do the math, her total take is nearly $6 million in bonuses and stock sales. In mid-day trading on Monday, Feb. 2, IBM shares were changing hands at $152.55. Second, amid reports that IBM so far has laid off about 5,000 employees, a sampling of worker posts at the watchdog Alliance@IBM forum leaves the immediate impression the vendor has its work cut out to shore up employee morale if it intends to do so. With the fur flying that IBM intentionally rated employee performances low to avoid paying full severance packages along with charges that it tagged older workers to cut from its rolls, it may be quite some time until it’s able to mollify what appears to be an unhappy workforce. Here’s a sampling of what’s being said at Alliance@IBM about Rometty’s bonus payout. Of course, these comments aren’t representative of all IBM employees and shouldn’t be seen in that light. But they do provide some insight into the aftermath of IBM’s layoffs and Rometty’s 2014 incentive package. So let me get this straight, [IBM} said Chief Executive Virginia Rometty will receive a $3.6 million bonus for her performance in 2014, despite annual declines in profit and revenue…The last three CEOs and executives and manager have done a great job running this once great company right into the ground. Rometty needs to read the history of IBM and the founder TJ Watson. If he knew that a CEO had not made a profit in any quarter since she had been CEO and received a $3.6 million [bonus] for one year, he would be rolling over in his grave. This is outrageous. The same week thousands are being essentially fired, the IBM Board of Directors awards Ms. Rometty substantial salary and bonus incentives. Either the BOD is insensitive as to the timing or they are sending everyone a message that they approve of her leadership. In any case, both may be correct. …The news that Ginni is receiving an enormous bonus and raise after driving this company into its current sorry state was the last straw. IBM executive management needs to know and understand that what IBMers do matters to the world. They provide their skills, effort, and talent in service of humankind, to the benefit of the whole community—not to fill the pockets of a select few. This raise for the IBM CEO is nothing less than an ABSOLUTE kick in the face and onto the ground for all the IBM employees,ex employees who have sacrificed SO MUCH and have seen their salaries cut, benefits cut, pensions cut, even tens of thousands of jobs cuts…Lord knows God knows, what goes around comes around….When the business continues to fail as it has been, there will be big changes at the top…and VERY soon. Really? While I agree that the CEO incentives are nothing short of a slap in the face to the regular employees of IBM… I totally disagree with your comment “what goes around comes around”… This has been the IBM way for a very long time – way before the current CEO. Ever since the Watson’s left. The only change at the top that will come about is that they move one and replace them with another. IBM should fire Ginni Rometty. It looks like airline corporation, when airline file a bankruptcy, CEO get a big bonus. Is that IBM is filing a bankruptcy? It is funny, Ginni bonus is comes from layoff employee. If 14 quarters of Revenue drops does not get (Rometty) Fired, what will ? Following the ill timed and insulting article Sam posted on Forbes, I am completely speechless. Shame on you Sam and shame on you Ginni . THINK!!! I can’t remember the last time I bought any IBM product or service. What do they even sell anymore and why are they relevant? The 5K is just the layoffs. The 5K is just the layoffs. Now come the performance based firings of all of the Transition To Retirement (T2) folks that instead of being given what management promised in exchange for their identification as interested in leaving or retiring will now all be fired without any expense to the company, thanks to a hidden exception. Totally Machiavellian! A company that cannot be trusted. 3.6 million dollar bonus for losing business, who paid it HP or Oracle? Surely IBM’s board would not reward incompetence. Or Maybe she bribed Watson…. For years, dating back to Gerstner, the IBM Corporate HR plan was to move to an “average” 5 year employee. That means almost constant layoffs and rebalancing, while maintaining approximately the same number of WW Employees. I was “in the room” when that plan was explained by the Corp HR Exec during Gerstner’s time. What has changed during that time is that Sam and Ginni brought back massive layers of Management that Gerstner had flattened. That makes IBM totally dysfunctional because none of those VP’s want to own or be responsible for anything. Decisions are chased up the Management Chain endlessly. No improvements in sight. One of the worst CEOs ever, in the history of this planet, hell bent on destroying a century old company. And she receiving a bonus despite 11 quarters of straight loss, is preposterous!! In an organization where employees are penalized for disagreeing with their incompetent, nincompoop, spineless and brainless bosses, such an event is only to be expected!! Shame!!! Because it lost a previous age discrimination lawsuit, IBM is legally required to give current and future laid-off employees a list of the names and ages of all those subject to “resource actions” (i.e., layoffs). The most recent round of laid-off workers should have received such a list in the packets they got from the company the day after their managers called them to tell them they were being terminated. But the list of names/ages was not included in the packets. Looks like IBM may be headed for another age-discrimination lawsuit. And to add insult to injury, the managers who laid off admin assistants and others who had been with the company more than three decades wanted to send out “retirement announcements” on their behalf and hold a retirement lunch or dinner for them. Nice that she is getting a Bonus, while IBM worker salaries remain frozen. And once again no bonus’s for employees. Rometty is NOT a leader. A leader would not accept bonuses if their followers weren’t receiving them. In fact, I hardly think she qualifies as a human being. She’s playing a major role in destroying the economy of the country where she was born. Traitor. They should pay Ginni 50 million a year because after they fire the entire workforce Ginni and her squadron of flying monkeys are going to have to put in some atrocious hours. This is going to be huge; that how an executive gets bonus at the time when vendors are suffering from revenue. Every organization are facing several kinds of financial crisis and therefore they used to take preventive steps to maintain a good annual balance sheet through which they are able to run the organization smoothly.